How do you measure success? Numbers on a spreadsheet, cash in the bank? Profit, turnover, market share? GDP of a country’s economy? And does buying more “stuff” make you happy? Business is great at creating wealth, but what happens next? Does business create value? What happens to “surplus” value? Simon Biltcliffe is the “Marxist-Capitalist” CEO and founder of Webmart, a £31m turnover business. His keynote address at the MADE Entrepreneurship Festival last week demonstrated Webmart’s success as a living case study as a profitable, values-driven business, which maximises the intellectual value, emotional return and financial performance of staff, and shares the profit amongst the business’ team and through a charitable trust. Simon is proud of Webmart’s history of 21 years of profitability; proud of the tax contributed by the business to the UK; proud of providing an enabling environment for his team. He joined me for a 20 minute interview at the MADE Festival covering his business philosophy (and how being outdoors, hard house music plus Yorkshire Tea contribute to a personal MBA). 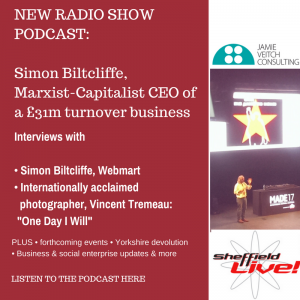 The interview was first broadcast on my Sheffield Live radio show last Friday morning and you can listen to the podcast below. The show also features internationally-acclaimed photographer Vincent Tremeau in a live phone interview from Senegal. Tremeau is the founder of the One Day I Will project and an exhibition of his work takes place in Sheffield this week. 40:57 – 46:00 call to be involved; public vote announced for Barnsley and Doncaster regarding Yorkshire devolution proposal; Sheffield’s Cherry Tree Pub listed as an “Asset of Community Value,” Meet the Journalists more events including and AlgoMech; wrapping up.